The bacterium Escherichia coli can be grown employing various carbohydrates as sole carbon and energy source. Among them, glucose affords the highest growth rate. This sugar is nowadays widely employed as raw material in industrial fermentations. When E. coli grows in a medium containing non-limiting concentrations of glucose, a metabolic imbalance occurs whose main consequence is acetate secretion. The production of this toxic organic acid reduces strain productivity and viability. Solutions to this problem include reducing glucose concentration by substrate feeding strategies or the generation of mutant strains with impaired glucose import capacity. In this work, a collection of E. coli strains with inactive genes encoding proteins involved in glucose transport where generated to determine the effects of reduced glucose import capacity on growth rate, biomass yield, acetate and production of an experimental plasmid DNA vaccine (pHN). A group of 15 isogenic derivatives of E. coli W3110 were generated with single and multiple deletions of genes encoding glucose, mannose, beta-glucoside, maltose and N-acetylglucosamine components of the phosphoenolpyruvate:sugar phosphotransferase system (PTS), as well as the galactose symporter and the Mgl galactose/glucose ABC transporter. These strains were characterized by growing them in mineral salts medium supplemented with 2.5 g/L glucose. 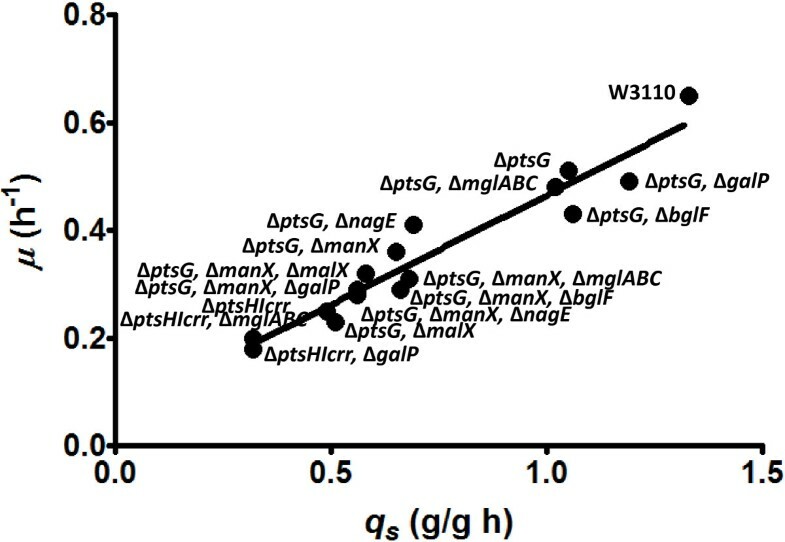 Maximum specific rates of glucose consumption (q s ) spanning from 1.33 to 0.32 g/g h were displayed by the group of mutants and W3110, which resulted in specific growth rates ranging from 0.65-0.18 h-1. Acetate accumulation was reduced or abolished in cultures with all mutant strains. W3110 and five selected mutant derivatives were transformed with pHN. A 3.2-fold increase in pHN yield on biomass was observed in cultures of a mutant strain with deletion of genes encoding the glucose and mannose PTS components, as well as Mgl. 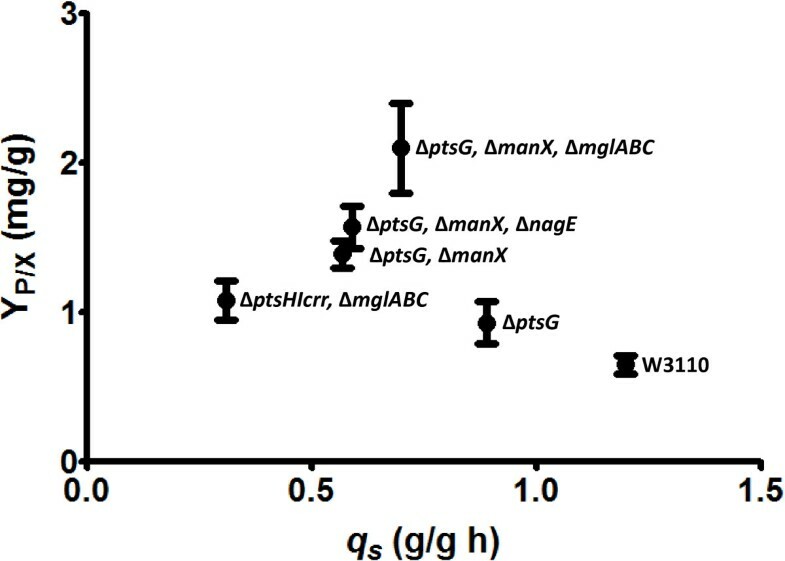 The group of E. coli mutants generated in this study displayed a reduction or elimination of overflow metabolism and a linear correlation between q s and the maximum specific growth rate as well as the acetate production rate. By comparing DNA vaccine production parameters among some of these mutants, it was possible to identify a near-optimal glucose import rate value for this particular application. The strains employed in this study should be a useful resource for studying the effects of different predefined q s values on production capacity for various biotechnological products. Biotechnological processes with Escherichia coli strains modified for protein, DNA or metabolite production frequently employ media containing glucose . This carbohydrate is widely utilized as a raw material since it is relatively inexpensive and it is the preferred carbon and energy source for E. coli and other industrial microorganisms. In E. coli, glucose is internalized into the cytoplasm by the phosphoenolpyruvate:sugar phosphotransferase system (PTS). This is a complex protein system, widespread in bacteria and absent in Archaea and eukaryotic organisms . PTS also participates in the transport and phosphorylation of other carbohydrates in addition to glucose. This system is composed of the soluble and non sugar-specific protein components enzyme I (EI) and the phosphohistidine carrier protein (HPr) that relay a phosphoryl group from phosphoenolpyruvate (PEP) to the sugar-specific enzymes IIA and IIB. PTS components IIC, and in some cases also IID, constitute integral membrane protein permeases that transports sugar molecules, which are phosphorylated by component IIB (Figure 1). In E. coli, 21 different enzyme II complexes have been identified that participate in import and phosphorylation of various carbohydrates . Glucose is imported by the glucose enzyme II complex (IIGlc) that includes the IIAGlc enzyme and the integral membrane permease IICBGlc. The mannose complex (IIMan) is composed of the IIABMan enzyme and the integral membrane permease IICDMan. It has been reported that in addition to mannose, this PTS complex can also transport glucose . An E. coli mutant strain with inactive glucose PTS complex still displays growth on glucose with a rate corresponding to about 80% of that observed in a wild type strain . Proteins involved in glucose transport and phosphorylation in E. coli . EI, enzyme I; HPr, phosphohistidine carrier protein; IICB Glc , integral membrane glucose permease; IIABC Bgl , components of the beta-glucoside PTS complex; IIAB Man and IICD Man components of the mannose PTS complex; IIBC Mal , components of the maltose PTS complex; IIABC Nag , components of the N-acetylglucosamine PTS complex; GalP, galactose:H + symporter; MglA, MglB and MglC, components of the galactose/glucose high-affinity ABC transporter; LamB, OmpF and OmpC, outer membrane proteins. When E. coli grows under conditions of glucose limitation, proteins normally involved in galactose transport are induced and can also import glucose . This physiological response has also been observed in E. coli strains with inactive PTS, even when growing in non-limiting glucose concentrations . One of the genes induced under these conditions is galP, encoding the galactose:H+ symporter GalP . The genes mglABC, encoding an ATP-binding protein, a galactose/glucose periplasmic binding protein and an integral membrane transporter protein, respectively, are also induced under glucose limitation. These proteins constitute the high-affinity ABC transporter Mgl system, involved in galactose/glucose transport . The enzyme glucokinase, encoded by glk, catalyzes the ATP-dependent phosphorylation of the glucose molecules internalized by GalP or the Mgl system . Under aerobic conditions when the glucose concentration in the medium is non-limiting, E. coli displays a high rate of substrate consumption and a corresponding high specific growth rate (μ). Under these conditions, E. coli secretes the organic acid acetate [10, 11]. This is the result of a metabolic imbalance, also known as overflow metabolism, where the rate of acetyl-coenzyme A (AcCoA) synthesis surpasses the capacity of the tricarboxylic acid (TCA) cycle to completely consume this metabolite. Therefore, the amount of AcCoA not consumed by the TCA cycle is diverted into the phosphotransacetylase (Pta)-acetate kinase (Ack) pathway where acetate is synthesized . 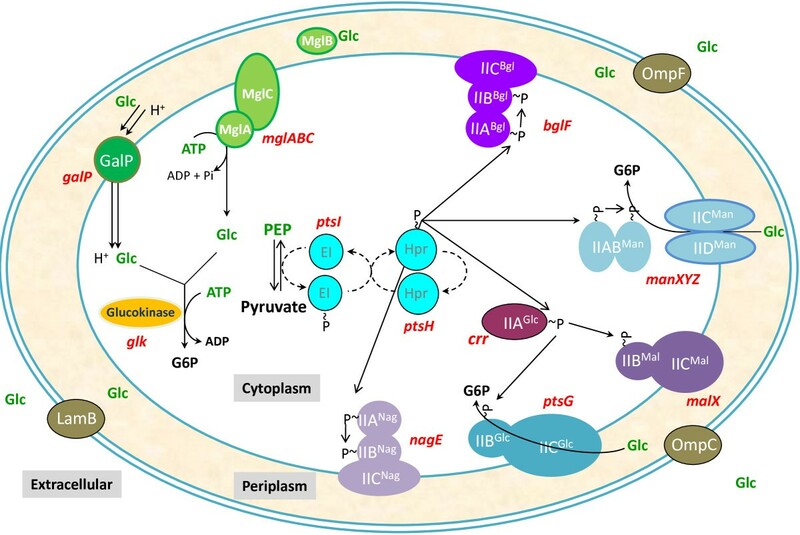 Recent studies have proposed that acetate synthesis by the Pta-Ack pathway and its assimilation by AcCoA synthethase (Acs), constitute a futile cycle that maintains a physiological level of the regulatory metabolite acetyl-phosphate. A shift towards acetate accumulation occurs as a result of carbon catabolite repression of Acs expression under conditions of high glucose import rates [13, 14]. Acetate production is a problem since this constitutes the loss of precursor molecule AcCoA. In addition, acetate is a toxic organic acid whose accumulation in culture media reduces productivity . Solutions to this problem involve glucose feeding strategies to maintain a low concentration of this sugar in culture medium and also the generation of mutant strains with impaired acetate biosynthesis capacity [16, 17]. In addition, mutant strains with reduced glucose import capacity have been generated with the purpose of decreasing acetate production. Inactivation of gene ptsG, encoding IICBGlc, resulted in a significant reduction of acetate secretion with a concomitant increase in production of a recombinant protein . The complete inactivation of PTS by deletion of the ptsHI-crr operon encoding EI, HPr and IIAGlc combined with the chromosomal overexpression of gene galP, encoding a non-PTS glucose importer, resulted in a strain displaying a PTS– Glc+ phenotype, a lower rate of acetate production and a higher capacity for recombinant protein production . One of the biotechnological products synthesized nowadays by recombinant E. coli is plasmid DNA (pDNA), which can be used as an alternative for gene therapy and immunization in various therapeutic applications . Since plasmid titer is directly related to biomass formation, fermentation strategies for pDNA production are based on increasing cellular density. However, as stated above, acetate production can be an important drawback in this type of cultures. Some of the strategies employed to reduce acetate production in E. coli have been applied to pDNA production, with various degrees of success [19–21]. In the case of PTS modification, the use of a strain with a PTS– Glc+ phenotype and reduced q s , resulted in increased production of pDNA . The above examples illustrate how a q s reduction in E. coli can have a positive effect on strain performance for the production of recombinant proteins and pDNA. However, previous works have focused on generating and studying either one or a few mutant strains with altered q s . It remains to be determined what would be the physiological and production performance effects of altering q s over a wide range of values in a group of isogenic strains. With this purpose, a collection of E. coli mutants was generated with mutations in transporter proteins involved in glucose import. This group of 15 mutants and wild type W3110 span a q s range from 1.33 to 0.32 g/g h, enabling a comparative study of the consequences of altering, within predetermined values, the glucose import capacity on key physiological parameters and the capacity to produce pDNA. The strains used in this work are described in Table 1. The reference strain E. coli W3110 is a derivative of E. coli K-12 . Mutant derivatives of W3110 were constructed by P1 transduction, chromosomal gene inactivation employing PCR products or a combination of both methods . Table 1 indicates the donor strains from the Keio collection that were employed as donors for P1 transduction experiments and the names of the oligonucleotides employed for PCR product gene inactivation . To generate strains with more than one mutation, the gene encoding for kanamycin (Kan) resistance was excised employing plasmid pCP20 that expresses recombinase FLP . Verification of the desired genotypes was made by PCR employing pairs of primers as follows: ptsG, ptsGF and ptsGR; manX, manXF and ManXR; malX, MalXF and MalXR; bflF, bglFF and bglFR; nagE, nagEF and nagER; glK, glk2F and glk2R; galP, galPF and galPR; mglABC, mglABF and mglABR; ptsHIcrr, PTSF and PTSR. Plasmid pcDNAHN176-construct (pHN) is an experimental vaccine against mumps. It contains the pUC origin of replication, an ampicillin resistance gene and a viral haemagglutinin-neuraminidase gene cloned under transcriptional control of the cytomegalovirus promoter . *The donor strain employed in P1 transduction or the names of the oligonucleotides employed for gene inactivation with PCR products are indicated. The medium used during mutant strains construction and selection was Luria-Bertani (LB) with the corresponding antibiotic: chloramphenicol (Cm) 10 μg/mL, Km 10 μg/ml and carbenicilin (Cb) 100μg/mL. For shake flask cultures M9 mineral medium was used, containing 2.5 g/L glucose, 6 g/L Na2HPO4, 0.5 g/L NaCl, 3 g/L KH2PO4, 1 g/L NH4Cl, 0.5 g/L MgSO4•7H2O 0.01 g/L CaCl2 and 0.01 g/L thiamine hydrochloride. Cultures with strains for pHN production were performed in shake flasks with PD medium containing 2.5 g/L glucose, 17 g/L K2HPO4, 5.3 g/L KH2PO4, 2.5 g/L (NH4)2SO4, 1 g/L (NH4)Cl, 1 g/L sodium citrate, 1 g/L MgSO4 · 7H2O, 0.01 g/L thiamine hydrochloride and 2 mL of a stock solution of trace elements . Glucose and salts solution were sterilized separately at 121°C during 20 minutes. All stock cultures were stored at −70°C in LB medium containing glycerol (40% v/v). The inoculum for shake flasks cultures consisted of 5 ml from LB overnight cultures that were sub-cultured in shake flasks containing 50 ml of M9 or PD medium with 2.5 g/L glucose starting with an OD600nm = 0.1 and incubated at 37°C, 300 rpm in an orbital shaker until an OD of 2.0 was reached, then, a sample was used to inoculate shake flasks containing 50 mL of the same medium. Samples for analysis were taken periodically. The OD600nm was determined and cells were centrifuged (13,000 g for 5 min) and the supernatant used for glucose and acetate determination by HPLC. In cultures for pHN production, an additional sample was taken to determine plasmid DNA concentration. The employed OD600nm and cell dry mass (CDM) (g/L) correlation was CDM = 0.45 x OD600nm. The concentration of D-glucose and organic acids was determined employing an Aminex HPX-87H column (300 X 7.8 mm; 9 Am Bio-Rad, Hercules, CA). Separation was carried out isocratically with 5 mM H2SO4 at a flow rate of 0.5 mL/min and a temperature of 50°C. Under these conditions glucose was detected by refraction index and acetic acid by photodiode array at 210 nm. For these measurements a Waters HPLC system was used: 600E quaternary pump, 717 automatic injector, 2410 refraction index, and 996 photodiode array. pHN concentration was determined by extracting plasmid DNA with the Qiagen Spin Mini Prep kit (Hilden, Germany), following manufacturer instructions. The plasmid DNA concentration was determined at 260 nm using a Nanodrop UV spectrophotometer . For the characterization of the strains used in this work, maximum specific rates of growth (μ), glucose consumption (q s ), acetate production (q ac ), pHN plasmid production (q p ), yield of biomass on glucose (YX/S), yield of acetate on glucose (Yac/S), yield of acetate on biomass (Yac/X), yield of plasmid on glucose (YP/S) and yield of plasmid on biomass (YP/X) were determined. Yield values were calculated using linear regression of product concentration versus substrate or biomass concentration during the exponential growth phase. The linear least squares fit to the data displayed R 2 values equal or higher than 0.97. These parameters were calculated during exponential growth phase. Flask cultures were performed in triplicate and the values reported represent the mean of all experiments. The aim of this study was to generate and characterize a group of mutants derived from strain W3110, displaying a wide range of q s values. The strategy followed to progressively decrease glucose import capacity consisted on inactivating genes encoding PTS components and non-PTS transport proteins. Under the growth conditions employed in this study (glucose 2.5 g/L), it can be expected that glucose is transported by the PTS, since the K M of IICBGlc for this sugar is 3 to 10 μM (0.6 to 18 mg/L) . Therefore, mutants with inactive IICBGlc and other PTS components were generated and characterized. It has been reported that IICDMan can transport glucose in a strain lacking IICBGlc activity . However, it is not known which of the other remaining PTS complexes could be involved in glucose transport in the absence of IICBGlc or in a double mutant lacking both IICBGlc and IICDMan components. In this study, we chose to inactivate selected components from the glucose and mannose PTS families, assuming they would show specificity towards glucose as substrate since both, IICBGlc and IICDMan, can transport this sugar. Since the number of PTS complexes belonging to these two families is rather large, only a few members were arbitrarily selected for inactivation. 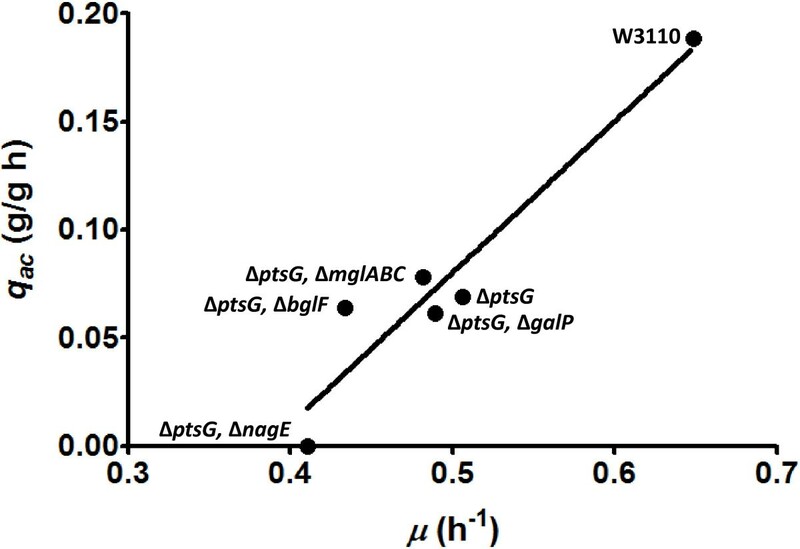 Single, double and triple mutant derivatives of W3110 were constructed including genes encoding transport proteins from the glucose (ptsG), mannose, (manX), beta-glucoside (bglF), maltose (malX) and N-acetylglucosamine (nagE) PTS complexes. Inactivation of ptsG (strain WG) caused a 21%, 22% and 63% reduction in q s , μ and q ac , respectively (Table 2 and Additional file 1: Figure S1). This is expected since IICBGlc is the main glucose importer under the studied conditions. However, these results also show that there is still significant remaining glucose import capacity in the mutant strain; therefore, other transport proteins are involved in this process. To generate mutant derivatives of strain WG with further reduced q s , genes encoding specific components of the above-mentioned PTS complexes were inactivated. In the ptsG- background, inactivation of malX (strain WGX), nagE (strain WGE) or manX (strain WGM) caused a further reduction in q s and μ. Furthermore, no acetate was detected in the supernatants of cultures with these three strains, indicating the elimination of overflow metabolism (Additional file 1: Figure S1). In contrast, inactivation of ptsG and bglF (strain WGB) did not decrease q s , when compared to strain WG. These results indicate that mannose, maltose and N-acetylglucosamine PTS complexes contribute to glucose import in the absence of IICBGlc. From strain WGM, mutant derivatives were generated to determine if beta-glucoside, maltose or N-acetylglucosamine PTS complexes participate in glucose transport in this genetic background. From these mutant strains, only WGME showed a reduction in q s and μ of 58% and 57%, respectively, when compared to W3110. Previous results indicated that strain WGME displays growth on glucose even after the inactivation of several transport proteins. Glucose transport in this strain could be dependent on both PTS and non-PTS transport proteins. To determine the extent of the contribution to glucose transport of the still-active PTS complexes in strain WGME, a mutant derivative of W3110 was generated by deletion of the ptsHI, -crr operon (strain WHI). Deletion of genes encoding EI and HPr disrupts the phosphotransfer chain, thus rendering all PTS complexes inactive. As expected, the complete elimination of PTS activity caused a severe reduction in q s and μ of 64% and 62%, respectively, when compared to W3110. When compared to WGME, strain WHI showed 12% and 14% reduction in μ and q s , respectively. These results suggest that approximately 14% of the glucose import capacity in WGME is dependent on one or several of the still active PTS complexes in this strain, and the remaining capacity is dependent on non-PTS transporters. However, this conclusion should be taken with caution, since PTS is involved in regulatory processes that include genes encoding non-PTS transporters . Therefore, it cannot be ruled out that altered regulatory responses on genes encoding non-PTS transporters could occur in strain WHI, when compared to WGME. The transporter GalP and the Mgl protein system are known to participate in glucose import under conditions of glucose starvation. Even though the culture medium employed in this study contains a non-limiting glucose concentration, as a result of the inactivation of glucose importers, a low intracellular level of glucose-6-phosphate and other central metabolism intermediates could be expected in the mutant strains displaying low q s values. To determine if GalP or Mgl are involved in glucose transport in some of these strains, derivatives lacking either one of these two importers were generated from WG and WGM. Strains WGP and WGC showed similar q s and μ values as progenitor strain WG, indicating that GalP or Mgl do not contribute to glucose import in this genetic background. Whereas in the WGM background, strain WGMC did not show a change in glucose import capacity, while mutant WGMP displayed a decrease in q s and μ. These results show that only after the q s decreases to a value close to 0.65 g/g h, then a contribution of GalP to glucose import can be detected. To determine the involvement of non-PTS transporters on glucose import capacity in strain WHI, derivatives with inactive galP (WHIP) or mglABC (WHIC) were generated and characterized. Both mutants displayed a 35% reduction in q s when compared to progenitor WHI. These results indicate that both GalP and the Mgl system contribute to glucose import in the strain lacking functional PTS. When comparing the YX/S values among wild type and mutant strains, minimal differences were detected. The group of strains characterized in this study, including wild-type W3110, display a wide range of q s , μ and q ac values. Under the conditions employed here, μ correlated linearly with q s (R2 = 0.92) (Figure 2). This result is consistent with the small differences in YX/S among strains. As result of the distinct q s values displayed by these strains, the amount of time taken to completely consume the 2.5 g/L of glucose in the culture medium varied from 6 to 28 h (Additional file 1: Figure S1). In addition to the physiological effects of such glucose consumption rates, these differences would be expected to have an impact on strain production capacity, mainly specific productivity, for various biotechnological products, as will be discussed below. Specific growth rate as a function of the specific glucose uptake rate for various E. coli strains generated in this study. When considering data from the five strains that accumulated acetate in the medium (W3110, WG, WGB, WGP and WGC) and WGE, the mutant strain with the highest q s and μ values that did not produce acetate, it was found that q ac correlated linearly with μ (R2 = 0.91) (Figure 3). It is not possible to ascertain if the observed correlation is maintained at μ values lower than 0.43 h-1 (strain WGB), nevertheless, linear regression analysis of this data was employed to calculate μ = 0.39 h-1 as the value corresponding to a q ac = 0. This value is close to a μ of 0.375 h-1, that was determined from glucose-limited continuous cultures with E. coli K-12 TG1, as the lowest value where acetate was detected . A study employing accelerostat cultivations with strain MG1655 identified a two-phase acetate accumulation pattern . The slow rate acetate accumulation phase started at a μ of 0.27 h-1, whereas high rate acetate accumulation was detected at a μ of 0.46 h-1. Assuming a similar physiological response between strains MG1655 and W3110, it is possible that acetate accumulation in this study with mutant derivatives was detected until the high rate production phase was reached. Further detailed analyses, employing accelerostat or chemostat cultivations, should allow determination of the specific acetate accumulation pattern for each mutant strain. Specific acetate production rate as a function of the specific growth rate for various E. coli strains generated in this study. The qualitative effects on q s and μ of deleting specific PTS and non-PTS transporters in strain W3110 are in agreement with results reported with mutant derivatives of E. coli strains MG1655 and AF1000 having some of the same gene deletions performed in this study [30–32]. However, the magnitude of q s reduction as function of specific gene inactivation differs from our results. This can be explained considering that different culture media was employed and the strains genetic backgrounds are not identical. The characterization of the strains generated in this study enabled the identification of mutant derivatives of W3110 with distinct q s , and q ac values. In several of these strains, acetate production was reduced or absent. Lower acetate production and accumulation is associated with an increased capacity for pDNA production in E. coli cultures [19, 20]. To determine the effect of different q s , q ac and μ values on pDNA production capacity, some of the strains generated in this study were transformed with plasmid pHN. Strains W3110, WG, WGM, WGME, WGMC, WHI and WHIC were transformed with plasmid pHN to generate recombinant strains W3110p, WGp, WGMp, WGMEp, WGMCp, WHIp and WHICp, respectively. These strains were grown in shake-flask cultures with PD medium supplemented with 2.5 g/L glucose. This culture medium has been employed previously for pDNA production studies; therefore, it was used here to facilitate strain performance comparisons. During strain characterization, it was determined that strain WHIp did not grow in PD medium; therefore, it was not considered for further analysis. Table 3 summarizes the kinetic and stoichiometric parameters of the six remaining strains. Among these strains, acetate was detected only in cultures with W3110 (0.4 g/L) (Additional file 2: Figure S2). The maximum pHN titer level varied among strains, with WGMCp displaying the highest value. The same trend was observed for plasmid yield from glucose (YP/S) or from biomass (YP/X). The highest plasmid specific productivity was observed for strain WGMCp and also for WGMp. Figure 4 shows the YP/X as a function of q s for the pHN producing strains. Compared to strain W3110p, the YP/X for strains WGp and WGMCp were 1.4 and 3.2-fold higher, respectively. In the case of strain WGp, the observed increase can be explained by the lack of acetate production, when compared to W3110p. A similar result has been reported when comparing wild type and mutants defective in glucose transport in the case of recombinant protein production [18, 31, 33]. The final acetate titer in cultures with W3110p was not high enough to expect a toxic effect . Therefore, the increase in pHN production in strain WGp can be attributed mainly to the elimination of overflow metabolism, resulting in a more efficient use of the carbon source. However, the higher YP/X observed for WGMCp, when compared to WGp, cannot be explained by lower acetate production, since this metabolite was not detected in culture supernatants of either strain. Alterations to glucose consumption, either by the inactivation of glucose importers or feeding strategies to limit this nutrient, have been known to alter central carbon metabolism fluxes [26, 34]. It can be speculated that metabolic flux distribution in WGMCp favors the synthesis of DNA precursors, leading to higher pHN production. A more detailed comparative analysis of these strains, including fluxome and other “omics” approaches should allow a better understanding of the observed results. Plasmid pHN yield from biomass as a function of the specific glucose uptake rate for various E. coli strains generated in this study. A recent study has determined pHN plasmid productivity with strain DH5α, a high-performance plasmid production strain, under culture conditions similar to those employed here. This report revealed an YP/X of 6.56 ± 0.17 mg/g and a q p of 2.59 ± 0.12 (g/g h) for pHN . These values are approximately 3 and 5-fold higher for YP/X and q p , respectively, when compared to results with strain WGMCp. It should be pointed out, though, that strain DH5α bears several mutations that have the effect of increasing plasmid yield and productivity. It can be expected that these mutations would also increase plasmid production capacity in strain WGMCp, although the magnitude of such improvement cannot be estimated and would have to be determined experimentally. Compared to WGMCp, strains with progressively lower q s , WGMp, WGMEp and WHICp displayed a lower YP/X. It can be assumed that a low glucose consumption rate should cause a limitation of central carbon metabolism precursors and energy, having a negative impact on pHN production. A similar result has been reported when comparing two mutant strains for the production of a recombinant protein. A ΔptsG ΔmanX mutant produced less acetate than a ΔptsG mutant, but unexpectedly, also less recombinant protein . In this case, the authors point out that not only is low acetate production important for strain performance, but also an adequate cellular energy status. The control of plasmid replication is a complex process influenced by the cell physiologic state. Growth rate is one of the parameters that have an impact on plasmid copy number. For plasmids having a pUC origin of replication, such as pHN, a higher copy number is observed when comparing slow to fast growing cells . It has been generally accepted that plasmid copy number in inversely proportional to the growth rate . By altering glucose import capacity in the studied strains, cellular parameters such as q s , q ac and μ μ were simultaneously modified. All of these parameters influence pHN cellular content. The q s and μ displayed by strain WGMCp would represent optimal or near-optimal values for pHN production under the studied conditions which supports the idea that there should be an optimal flux distribution for pDNA synthesis, and that it may be reached not necessarily at very low growth rates. The physiologic state in this strain would be favorable for pHN production by having a relatively low μ that increases plasmid content and sufficient glucose import capacity to avoid carbon and energy limitation. When compared to WGMCp, strains WGMp, WGMEp and WHICp, have lower q s . Therefore, it is likely that these strains are energy and carbon-limited, and this state limits plasmid production capacity. A low energy state, resulting from a very low q s might also explain why strain WHI, when transformed with pHN, did not display growth in minimal medium. This is likely the result of incapacity to cope with the additional demand for precursors and energy required for plasmid replication. Previous publications have demonstrated an increased capacity for plasmid or recombinant protein production in strains having reduced glucose import capacity. However, in these reports only a few mutant strains were characterized. Therefore, only a small fraction of the potential phenotypic space was sampled. In contrast, in this study, a group of mutants was generated, covering a wide range of glucose import capacity in relatively small steps. By employing this collection of mutants, it was possible to identify a near-optimal glucose import rate for plasmid production capacity under the employed conditions. This q s value is associated to a physiological state were no overflow metabolism is present and the rate of glucose import still provides sufficient energy and metabolic precursors for cell growth requirements plus the burden of plasmid replication. To our knowledge, there is still no theoretical method to predict such a q s value, therefore, a combinatorial approach, like the one employed here, should be useful for correlating glucose consumption rate to several physiological and production parameters. A group of mutants with modified glucose import capacity was derived from E. coli W3110, a robust strain that has been employed as production host for various biotechnological products. This group of mutants affords a large degree of phenotypic diversity that can be explored when searching for specific genotypes leading to improved production capacity. The mutant strains generated and characterized here were employed in experiments for determining the correlation of distinct q s values to specific physiological and pDNA vaccine production parameters. Although similar data could be obtained by employing chemostat cultures, the use of mutant strains with modified glucose import capacity should simplify subsequent production processes by enabling constant glucose consumption rates in batch cultures. The characterization of a subset of the generated mutants allowed the identification of a near-optimal q s value for pHN production. A similar approach can be followed, employing this mutant collection, to identify phenotype(s) leading to the best production parameters for other products such as recombinant proteins. This work was supported by CONACyT grant 177568. LGF was supported by a fellowship from CONACyT. We thank Georgina Hernández-Chávez and Mercedes Enzaldo for technical assistance and Santiago Becerra Ramírez for oligonucleotide synthesis. LF, AM and GG participated in the design of this study. LF and LM constructed the strains. LF realized the batch cultures and analyzed the experimental data. LF, AL, OR, AM, FB and GG participated in the analysis of the results as well as in writing and critical review of the manuscript. All authors have read and approved the manuscript.